On Sunday my husband conquered knee and achilles injuries and ran the race of a lifetime in Rome, Italy. He finished 26.2 miles in a little under 4:50. I am so proud of him and wish more than anything that I could have been there to welcome him across the finish line. I heard he had a great celebration afterwards with some authentic, homemade Italian veal and pasta, so maybe he didn’t miss me too much! Especially since I’ve never made him veal — ever — in seventeen years of marriage. I just have a thing for babies, I guess. Speaking of babies, while hubby recovered from the marathon, my daughter and I went with some friends on a long trek to a Rhome of our own where we picked up the newest member of our family. Bella is a yellow labrador retriever. When we went to play with her and see if she would be a good fit for our family, she acted a little shy. She was quiet and happy to be held and cuddled. But on the way home, she began to show off her inner Marley, as in the book and movie Marley and Me. Because we already love her to pieces and want her to be a well-adjusted, obedient doggy who we enjoy being around, today we dropped her off at a Doggie Boarding School for two weeks of intensive training. 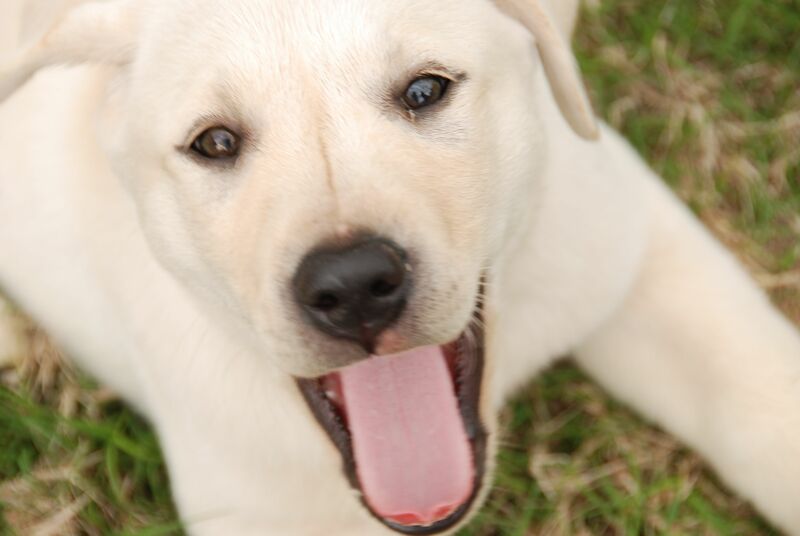 Then we’ll undergo owner training and will follow up with group obedience lessons. Hopefully Bella will have a better outcome than Marley did in obedience school. As I dropped her off today, desperate for some relief and some sleep after two nights of constant barking, I got tears in my eyes as I rubbed her furry ears and said goodbye. How is it possible to bond with an animal after just two days? It must have something to do with the cute little ridge on her nose or her soft, fuzzy ears. All this upheaval with Bella exercising her vocal displeasure at being in a crate against her will got me to thinking about OUR free will as humans under a Sovereign God. In the first verse, we are clearly given the option — either we come to Jesus and accept his teaching, or we don’t. In the second verse, the Lord himself is the source of our desire to worship Him. So we have this inner desire to worship the Lord, and we have the invitation from Jesus to accept his teachings…then we must choose our way…knowing that God already knows what we’re going to do before we do it! Does this knowledge take away from our will? Nope. If I were to give my daughter the choice to finish her homework before dinner and then play the Simms after dinner, or to play the Simms now and do homework after dinner, I know exactly which choice she will make. Play first, of course! But that doesn’t mean that I took the choice away from her. She would still get to choose. In the same way, the Lord gives us the choice. He knows how we will choose…but the choice is still ours. Previous Previous post: Countdown to the Race!